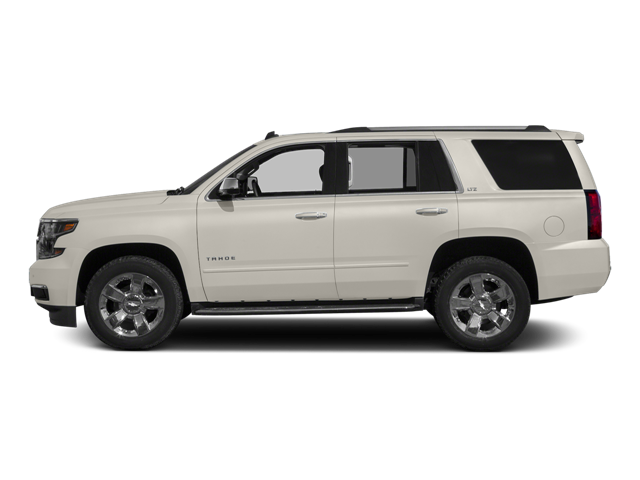 Tremendous capability seamlessly blends with outstanding luxury in our versatile 2015 Chevrolet Tahoe LTZ 4WD proudly displayed in White Diamond Tricoat with the Sun, Entertainment, and Destination package. Powered by a 5.3 Liter EcoTec V8 that offers 355hp while connected to a reliable 6 Speed Automatic transmission; allowing our LTZ to tow 8,300 pounds. Our Four Wheel Drive helps secure near 22mpg on the open road plus is solidly crafted for you and your demanding lifestyle; this Tahoe tackles any project with style and grace while offering a smooth, luxurious ride. The chiseled good looks of our LTZ are enhanced by unique 20-inch wheels, running boards, sunroof and LED daytime running lamps. Inside our LTZ, experience a perfect balance of form and function with comfortable seating for up to nine, plus all the technology you could ask for. Supple leather heated and cooled seats, a rearview camera, and parking sensors are just part of this tremendous LTZ. The kids in the back will be thrilled with rear audio controls, outlets for their devices, and the convenience of our tri-zone feature for personal comfort settings. Add in Bluetooth phone connectivity and a Bose premium sound system with a CD player, iPod/USB interface and satellite radio, and you'll be set for a successful trip! Take note of the fantastic Navigation and Upscale Rear Theater! With advanced safety features from Chevrolet such as lane departure and forward collision warning, rear cross traffic alert, and electronic stability control, you'll be confident that your precious cargo will be kept out of harm's way. Reward yourself with this Tahoe that can take you anywhere for everything. Print this page and call us Now... We Know You Will Enjoy Your Test Drive Towards Ownership! White Diamond Paint, LTZ, Sunroof, DVD Entertainment System, Navigation, Chrome Wheels, Loaded! Hello, I would like more information about the 2015 Chevrolet Tahoe, stock# 15908A. Hello, I would like to see more pictures of the 2015 Chevrolet Tahoe, stock# 15908A.